Do you want to protect your floor from unwanted scratches when moving your furniture? Our furniture felt pads made from heavy duty felt which keeps its shape longer than any other furniture floor pads. Adding adhesive felt under furniture provides a soft scratch proof ⅛ inches barrier between your furniture and floor surface reducing friction and noise. We found the right balance between pad thickness and density which gives the right stability and long lasting protection effect. Therefore, you can be confident that your floors stay protected. Chair leg pads are ideal for ceramic tile, hardwood, terrazzo, vinyl and marble floors, with ultra strong adhesion that protects flooring from deep furniture dents and scratches. 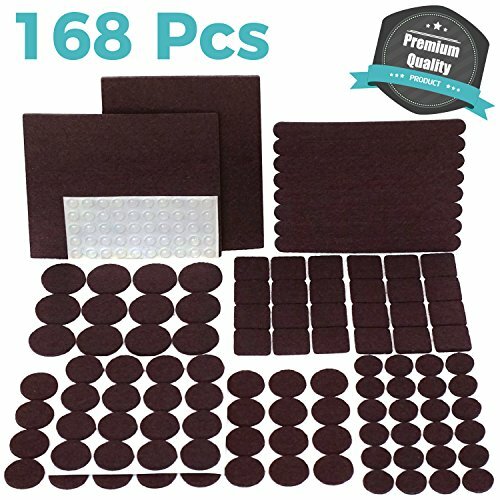 - BONUS Clear Rubber Bumper pads 50 pcs x round 5/16 inch with trusted 3M adhesive - perfect for plant pots, vases, doors, drawers and kitchen cabinets. 100% Satisfaction Guarantee when purchased from us ONLY. Our furniture foot pads are the perfect wood floor protectors that prevent from expensive varnishing and refinishing job. Click "Add to Cart" to eliminate possibility of scratches and make your floor protected with our Felt Furniture Pads! If you have any questions about this product by Gossip, contact us by completing and submitting the form below. If you are looking for a specif part number, please include it with your message.